Architecture of an Outfit: Catty Lazy Day Style » thereafterish. Architecture of an Outfit: Catty Lazy Day Style » thereafterish. My “Lazy Day Uniform” OOTD, is synonymous with my fashion motto: “Low effort, high impact.” It involves items with a visual punch that don’t involve a lot of effort to wear. 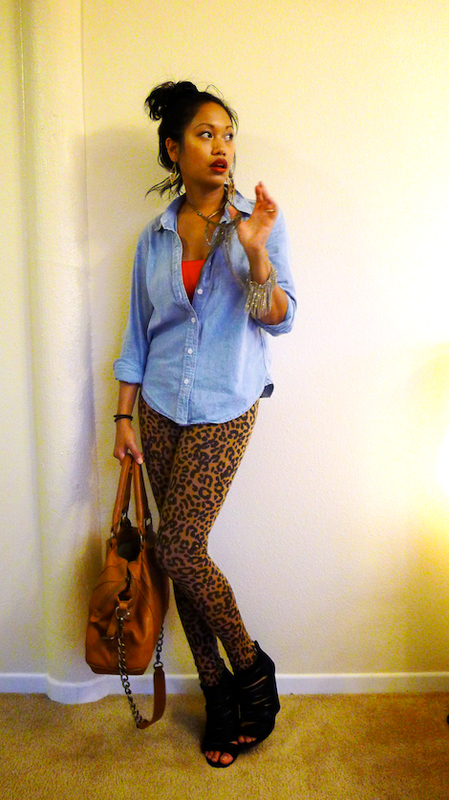 Leopard leggings, a neon bralette, the perfect red lipstick, crazy heels and edgy accessories like an fringe arm party. Lazy Day Dressing involves my go to chambray button down shirt and leopard leggings. High impact without any thought or effort at all. Go for a pop of color in the form of a bralette or bandeau. I found this for, like, $10 at a local boutique. Worn over a bra, since my girls are too big to go without support… 😉 I consider my leopard leggings a neutral, even though they’re quite busy. And seasonless chambray is a great complement to any outfit any time of the year, providing nice and fashionable Sun Protection while I’m driving, and perfectly casual and nonchalant. A button down is the easiest thing to wear, and still provides a hint of sophistication and maturity at the office while being insanely comfortable. A peek of color in the form of a neon bandeau top – provides a nice contrast to an otherwise slightly neutral outfit. Hive and Honey chambray buttondown. ASOS leopard leggings. Bamboo Sky neon bralette. River Island suede cage heels. Madewell fringe necklace. BR fringe bracelet. UO feather earring (worn singly). Bamboo Sky tribal earring (worn singly). Audrey Burke tan satchel. BUTTON DOWN ALTERNATIVE: Zappos.com chambray top with pockets. BRALETTE ALTERNATIVE: Free People Lace trim neon bandeau. 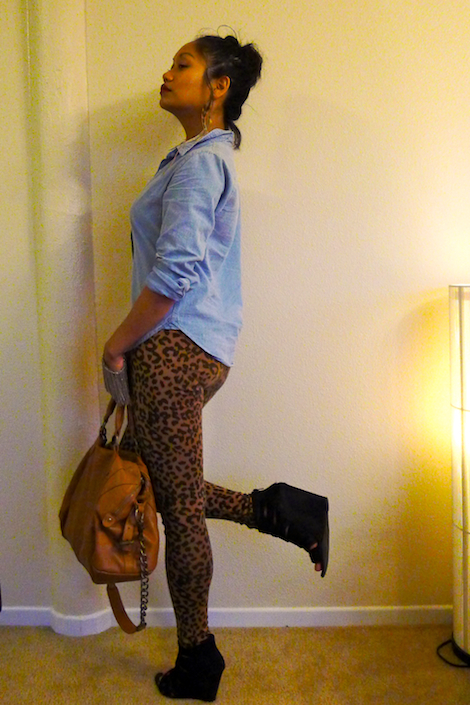 LEGGINGS ALTERNATIVE: Yoox leopard leggings | ASOS Evil Twin leopard leggings. CAGE HEELS ALTERNATIVE: Bebe cage platform heels | Zappos.com cage wedge heels. NECK PARTY ALTERNATIVE: “Joan Jett” gold fringe necklace | Nordstrom thorn cascade fringe necklace. 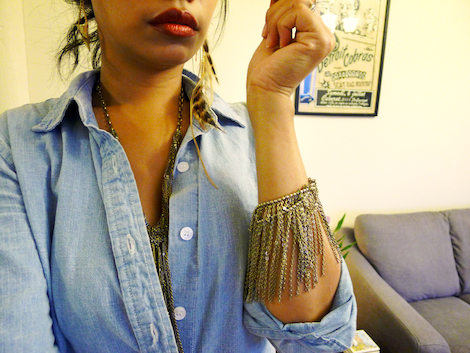 ARM PARTY ALTERNATIVE: Joan Jette gold fringe bracelet (EXTREMELY SIMILAR). Edgy details like mismatched earrings and fringe chain arm parties make the low effort of the outfit seem well-thought out. Wear fringe without abandon if you think your outfit is pretty blasé. Fringe adds a kind of party element to an ensemble without even trying at all. It might be a little out of place at the office, but thankfully I have no dress code at mine. I wear fringe and red lipstick unapologetically. I swear by red lipstick any time of the year. A bright, bold lip can change your entire face, brightening it and changing the mood of your outfit. 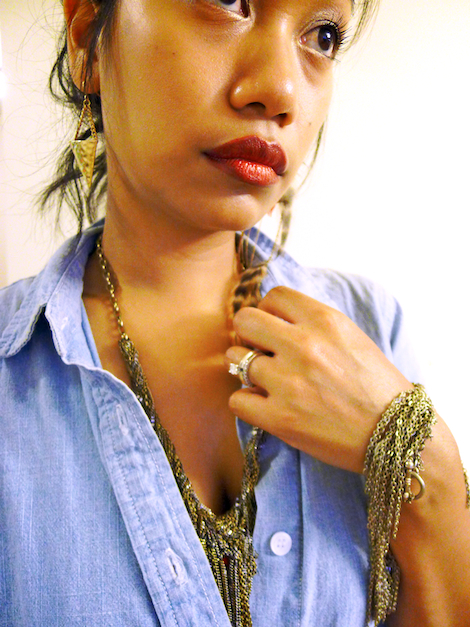 I wear Ruby Woo by MAC or Paprika by Nuance Beauty (sold at CVS/Longs stores). I believe Ruby Woo is the universally flattering red lipstick for all women of all complexions. Paprika can work with Asian and darker skintones. What’s YOUR lazy day style? Wishing you joy, happiness and beauty. Accessory PornArchitecture of an Outfitarm candyarm partyAsian Street Style FashionCage Heelschambray topFringefringe arm candyfringe arm partyFringe BraceletFringe Jewelryfringe necklaceGold JewelryHawaii FashionHawaii Street Stylelazy day fashionlazy day stylelow effort dressinglow effort styleOOTDOutfit of the Daythereafterish.